I just don't know what to do"
I heard this song on XM Radio yesterday (60's on 6) and it has been stuck in my head ever since. In this case, with such a great song, this is not a bad thing ... so I'm passing it along to you. That's a good one, but my Bacharach fave is still "Raindrops Keep Falling on My Head." Judy, I think this song is very much of its time, which I like ... I love older music. That said, I think Adele could do an amazing cover of this song if she felt inclined! I haven't heard this song...but I DO like it. 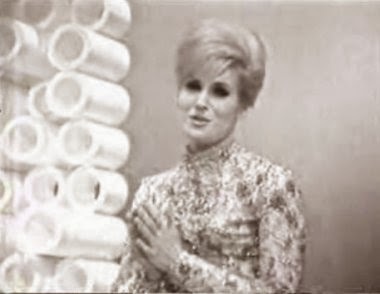 The only songs by Dusty Springfield that I really remember is "You don't have to say you love me" and "Son of a Preacher Man." I still dig her work even more as time passes. Her "Dusty In Memphis" album is still a must have for the collection. Agree with what you wrote in the comments about Adele. There is a whole sub-culture of Soul and R&B going on that is making new songs using the classic style as the template. I think she could do an album of covers that would be top notch. If she hooked up with some of the Daptone Records crowd and produced some new stuff I think she could blow a lot of folks away. Mary, I love "You Don't Have To Say You Love Me" - another of my favorite songs. Bobby, I think I need to find a CD of Dusty in Memphis! I agree about the new classic soul style music ... I really love it too.